Naturally controlling type 2 diabetes: herbs and foods? How to Naturally controlling Type II Diabetes? I am an Indian male 48 years. I have been diagnosed with Type II Diabetes a couple of months earlier. On the first test conducted by my doctor, the reading was 279mg. Since it was the very first reading ever done, my Doctor never prescribed any medicines but asked me to control my diet and to engage myself in some sort of and exercise plan (An early morning walk of about 1 hour plus a 20 minute light weight lifting) which I did. My blood sugar level reduced from 275mg to 90 in just a few weeks. I continued with my diet plan and also my exercise but as the weeks passed by and then, when a test was conducted the reading had once again increased to 261mg (evening/random) and 153mg (morning/fasting). breakfast: half a glass of bitter gourd juice (on empty stomach), a glass of white oats (unsweetened & unsalted), and a pealed cucumber. Lunch: an Indian bread (Whole grain flour mixed with Maida) with a vegetarian side dish and (Dinner) something normal which includes Vege and/or Non Vege. Other items that I consume are Green tea (unsweetened), I don’t intake any sorts of sweetened items and have completely given up on rice and pasta. I have still not started medication as I desperately want to control my Sugar Levels the natural way. To keep a track of my sugar levels I purchased a ACCU-CHEK Active Blood Glucose Monitor. But now I feel totally frustrated as my fasting reading shows 151mg (sometimes + 5/10%) and my after food reading shows 175-191mg. To be honest I need to tell you that I smoke, I know the harmful effects of smoking and I am on a quit plan. I consume alcohol, (1 - 2 pegs diluted with soda water) once or twice a week. I feel totally worried and as a matter of fact, my worries are now being of a matter of concern as far as my work is concerned. Could you please advice me if there is anything else I can do to reduce my sugar levels? Am I to start on medication? Please advice..
great job. I have to tell you that I’m impressed of your diet and training plan, because only few patients with diabetes, like you, are able to follow such plan. My advice, regarding this point, is to keep up with the good work, because it is for the sake of your health after all. Regarding you question, if you are able to control your diabetes, except for the medications, the answer is yes. You can use certain herbs, which are improving your glucose metabolism, which leads to reduced blood glucose level before and after having a meal. 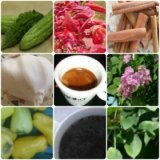 Some of the most effective herbs and minerals, used by diabetics are: Bitter Melon (as you are actually taking), Gymnema Sylvestre and Magnesium. It is true that, there are many more other herbs, which are used by diabetics, but these three herbs are going to help you definitely. However, I’m not sure, if you are going to control your diabetes without medications. The reason why I’m telling you this is because Diabetes type 2 is progressive condition. As you probably know, at the beginning there is a reduction in the insulin secretion, or the cells of your body, are expecting difficulties, during the execution of the effects, caused by the insulin. I’m not aware, which is the exact cause of your diabetes, but remember that at some point your body will stop to produce insulin, or your cells will become completely unable to execute the effects, caused by the insulin. Because of this, at certain point you will become obligated to start using drugs. In addition, you are telling that you are a smoker and also consume alcohol once or twice weekly. All these bad habits are like a stress-source to your body, damaging further your already impaired glucose metabolism. So, my advice is to gather all your strength and willing to fight both these bad habits in order to control your blood sugar. I understand that this will take some time, but it is worthy trying it. I want to congratulate you one more time for the big efforts you are trying and you will see that taking medications is not that scary and they will really help you to feel better. You seem dedicated man although certain bad habits follower. Hope it helped, and everything will be ok! Ask the Doctor now? Simply click here to return to Type 2 diabetes information. Border line type two diabetes - herbs and foods? I am Kathie and glucose tolerance test indicates that I am border line type 2 diabetic. I check my blood sugar almost every morning. Results range from 7.1 mmol/l to 8.5 mmol/l depending on what I had at dinner. Say if I eat white rice , the reading is 8. If I exclude rice, reading is 7. I am not on any kinds of diabetic medications as of concern about side effects of medication. Good news is that I drank bitter melon leaves tea the whole day yesterday and this morning test result readind is 6.5 mmol/l. Shall I keep doing it? Last night I had brown rice for the 1st time, by the way. I’m glad that you have found the amazing effect of bitter melon. However, I have to tell you that this is not the only thing, which you have to do in purpose to beat your diabetes. In other words, you have to start doing exercises, following a healthy diet and to avoid smoking cigarettes and drinking alcohol in purpose to control your blood glucose concentration and keep them within the reference ranges. The only bad thing is that you have to do this until the rest of your life. 1. Exercises. With the exercises, you burn the excessive amount of glucose, accumulated in your blood. This of course leads to lower blood glucose concentration along with reduced risk for developing diabetes and diabetic complication. In purpose to do this, you have to start walking for at least 30 minutes a day. With the time, it would be best for you to start running for about 30 minutes a day. Of course you can always combine running or walking with some mild physical activity like push-ups or something else. 2. Diet. The diet is important component of the natural diabetic treatment. I want you to know that your borderline-diabetic diet has to be composed of foods, which are with low cholesterol and low-glucose storage. In this way, you will reduce the intake of glucose, which will result with normal blood glucose level. Besides this, it would be better for you to start eating around 4-5 times a day, in purpose to ensure your body with constant intake of nutrients. Regarding the meals, I want you to forget about eating sweets stuff, like chocolate, candies, ice cream and others, at least for a while. In addition, you have to minimize the intake of white bread, pork, and beef. Please concentrate more on eating fish, vegetables and whole-grain bread. Of course, you can consult with a dietologist for further information. 3. Stop smoking, if you smoke of course. You have to know that smoking is very likely to cause atherosclerosis, in patients with diabetes. I want to inform you that the atherosclerosis and its consequences are very common in diabetics, because of the damaged glucose and lipid metabolism. The alcohol is not something good for you as well, because it leads to hypoglycemia, so I want you to avoid drinking it. 4. It will be good for you to reconsider using other herbs, despite of bitter melon. Some other effective herbs for borderline diabetes are cinnamon and gymnema sylvestre. 5. At last, I want you to monitor what is going on with the blood glucose concentration and to write down the value in a small note book. In this way, you can see if your disease progresses and what else you should do in purpose to keep your blood glucose normal.